Panoplosaurus mirus and Euoplocephalus tutus. Credit: Bourke et al, 2018. "The huge bodies that we see in most dinosaurs must have gotten really hot in warm Mesozoic climates," said Jason Bourke, Assistant Professor at the New York Institute of Technology College of Osteopathic Medicine at Arkansas State and lead author of the study. "Brains don't like that, so we wanted to see if there were ways to protect the brain from cooking. It turns out the nose may be the key." 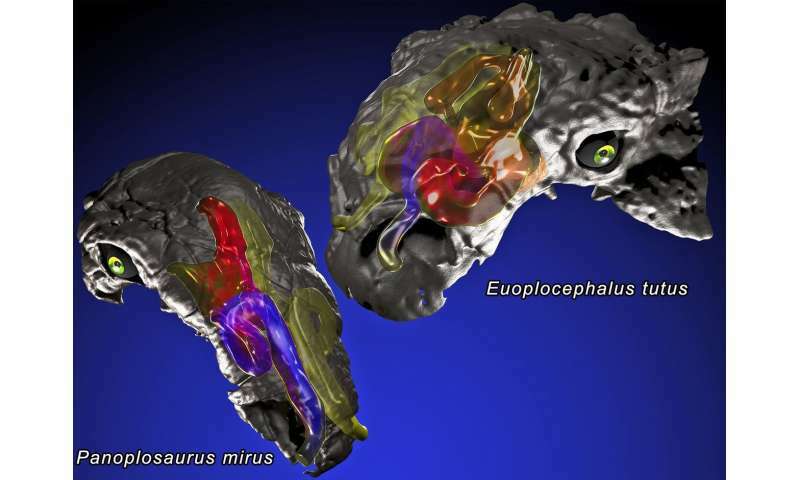 "A decade ago, my colleague Ryan Ridgely and I published the discovery that ankylosaurs had insanely long nasal passages coiled up in their snouts," said study co-author Lawrence Witmer, professor at the Ohio University Heritage College of Osteopathic Medicine. "These convoluted airways looked like a kid's 'crazy-straw!' It was completely unexpected and cried out for explanation. I was thrilled when Jason took up the problem as part of his doctoral research in our lab." "This project is an excellent example of how advances in CT scanning, 3-D reconstruction, imaging, and computational fluid dynamics modeling can be used in biological research to test long-standing hypotheses," said Kathy Dickson, a program officer at the National Science Foundation that funded the research. "From these new images and models, fossils can provide further insight into extinct organisms like the ankylosaur—in this case, offering an explanation of how unusual features actually function physiologically." Smell may be a primary function of the nose, but noses are also heat exchangers, making sure that air is warmed and humidified before it reaches our delicate lungs. To accomplish this effective air conditioning, birds and mammals, including humans, rely on thin curls of bone and cartilage within their nasal cavities called turbinates, which increase the surface area, allowing for air to come into contact with more of the nasal walls. "Ankylosaurs didn't have turbinates, but instead made their noses very long and twisty," said Bourke. When the researchers compared their findings to data from living animals, they discovered that the dinosaurs' noses were just as efficient at warming and cooling respired air. "This was a case of nature finding a different solution to the same problem," said Bourke. Just how long were these nasal passages? In Panoplosaurus, they were a bit longer than the skull itself and in Euoplocephalus they were almost twice as long as the skull, which is why they're coiled up in the snout. To see if nasal passage length was the reason for this efficiency, Bourke ran alternative models with shorter, simpler nasal passages that ran directly from the nostril to the throat, as in most other animals. The results clearly showed that nose length was indeed the key to their air-conditioning ability. "When we stuck a short, simple nose in their snouts, heat-transfer rates dropped over 50 percent in both dinosaurs. They were less efficient and didn't work very well," said Bourke. 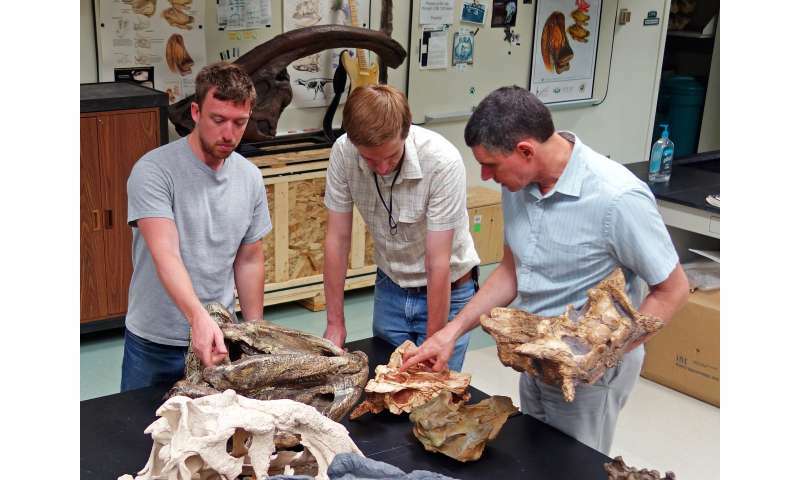 Authors of the article investigate key features in the skulls of ankylosaurian dinosaurs in WitmerLab at Ohio University. From left: Jason Bourke, Ruger Porter, and Lawrence Witmer. Credit: WitmerLab at Ohio University. "When we reconstructed the blood vessels, based on bony grooves and canals, we found a rich blood supply running right next to these convoluted nasal passages," said Ruger Porter, lecturer at the Ohio University Heritage College of Osteopathic Medicine and one of the study's co-authors. "Hot blood from the body core would travel through these blood vessels and transfer their heat to the incoming air. Simultaneously, evaporation of moisture in the long nasal passages cooled the venous blood destined for the brain." 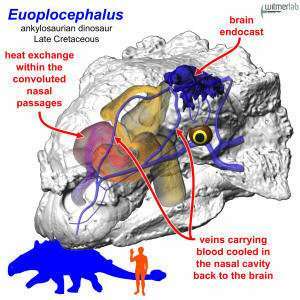 Heat exchange through the highly convoluted nasal passages of the Cretaceous ankylosaurian dinosaur Euoplocephalus not only efficiently warmed and humidified the inspired air on its way to the lungs but also cooled the blood running through the nasal veins, much of which was destined for the brain. In this way, the brain was protected from the high temperatures of the hot arterial blood coming from the body core. Credit: WitmerLab at Ohio University. "Sure, their brains were almost comically small," Bourke said. "But they're still their brains and needed protection." "When we look at the nasal cavity and airway in dinosaurs, we find that the most elaborate noses are found in the large dinosaur species, which suggests that the physiological stresses of large body size may have spurred some of these anatomical novelties to help regulate brain temperatures," Witmer said. "We know that large dinosaurs had these crazy airways, but at exactly what size did this happen?" Bourke said. "Was this elaboration gradual as body size increased, or is there a threshold size where a run-of-the-mill nose can no longer do the job? We just don't know yet."